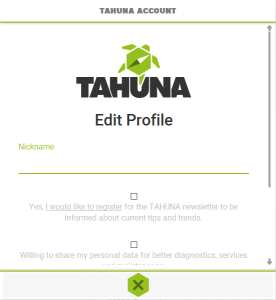 You can create a Tahuna account that contains all your data and is universally valid for all Tahuna products. To manage your account, click the Account Tab. By default it shows the text ‘Sign In’. You can use your Facebook or Google account to log in. To create an account, please register using an email address. To do this, click on the Account Tab, and select ‘Register’. This option will only be enabled if you have an active internet connection. To cancel the registration process, click the ‘Dismiss’ button at the bottom of the popup. Once you filled in your details and completed all necessary steps, you can log in using your account. You can log in or out of your account anytime. Once you are logged in, you don’t have to repeat the process when restarting the Tool. When you log out, the data stored on your computer is not deleted and is still accessible from the file system. However, you will not be able to use some of the functions within the Tool that need an active login (e.g. toursharing, tourbooks). To log in to your account, click the Account Tab, and select ‘Sign In’. This option will only be enabled if you have an active internet connection. To cancel the login process, click the ‘Dismiss’ button at the bottom of the login popup. This popup presents you with options to log in. After completing the process, the popup closes and the Account Tab will display your chosen username (the nickname you entered during registration. If you don’t have a nickname, your email username will appear instead). To log out of your account, click the Account Tab (your username) and select ‘Sign Out’. This option will be enabled even when your internet connection is not working. You have the possibility to change some of your account information. To do so, click the Account Tab and select ‘Account Settings’ from the drop-down menu. This option will only be enabled if you have an active internet connection. To close the popup, click the ‘Dismiss’ button. To view your account details, click the ‘Account details’ button within the popup. It is possible to associate your account(s) with Teasi devices. 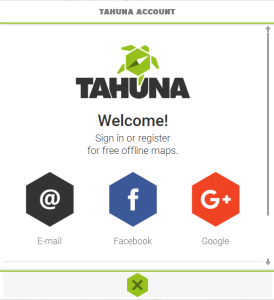 If you are logged in and connect a Teasi device (or vice versa), the Tool will prompt whether you would like to link your account to the device, saying: “Assign your account to the Teasi device?“. The popup has a checkbox with the text “Remember my choice” and two buttons: ‘Assign’ and ‘No’. Clicking ‘Assign’ will copy your account information onto your device. Clicking ‘No’ will close the popup. In both cases, checking the option “Remember my choice” will save your answer so the Tool can act accordingly in the future.